Content Freshness & Rankings | Does Fresh Content Impact SEO? You keep hearing around that the same way true fans like their Apples fresh (I’m talking about iPhones), Google likes its content fresh. Well, it’s somewhat true, but not for the reasons you might think of! Google doesn’t necessarily favor “fresh” content. Some search queries definitely deserve freshness, while others not so much. However, fresh content can impact SEO through some indirect “freshness” factors. What Does Fresh Content Even Mean? Who Does the Freshness Update Actually Affect? Does Fresh Content Impact SEO? To better understand the concept, we first must detail a little what “fresh content” actually means. What do you understand by fresh content? Content that has been published today? Content that is regularly updated? The term “fresh content” represents content that is dynamic in nature (especially in meaning). Therefore, it’s not as much “new” content in relation to time and when it has actually been created or published, but new in meaning and what the data behind it reflects. Many people believe that fresh content is content that has been recently published. Sometimes, they even mix up freshness with frequency. Let’s start with content that has been recently published. If I am publishing a piece on “The History of England”, would you call that fresh content? Most likely not, because people have been writing about the history of England for probably hundreds of years. It’s nothing new. 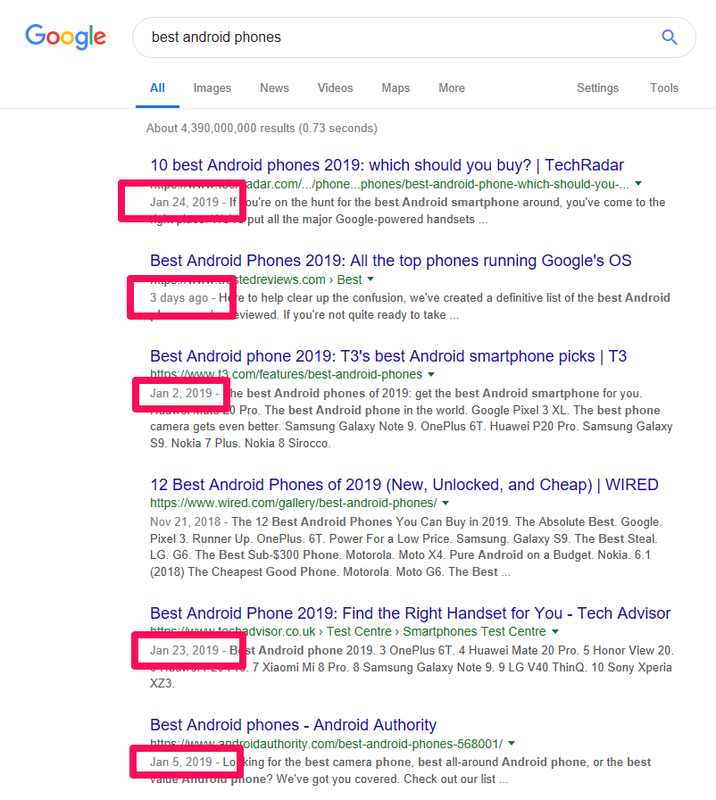 The post is new on my site, of course, but common SEO sense says that new content without any backlinks and amplification will have a harder time ranking, especially in very competitive niches, such as history (where Wikipedia probably dominates). You’ll have to make huge link building efforts to dominate the results with a new page and we all know how risky that is! (it usually results in a penalty). Now frequency is very similar to freshness and they often intersect, but it’s not always the case. I could post something fresh once per week, or I could post something fresh every day. Frequency will ensure that your site gets crawled more often (thanks to Caffeine). That means search engines will use more of their resources on sites that publish more often, because they need them. If you’ve been publishing once per month for the past year, why would Google check your site daily? It would be a waste of resources. However, if your site publishes 25 articles each day, then Google has to make sure it checks your site multiple times per day to index those results as soon as possible (thanks to Caffeine) and be able to display them to the users if they request it (thanks to the 2011 update). One common misconception is that stale websites will be negatively impacted. That’s been proven wrong. Brian Dean made this pretty clear with his blog. He publishes rarely, so his website is mostly still. However, his content always ranks at the top. I also have a blog in Romanian on which I haven’t posted in over 6 months. 9/10 articles are ranking on the 1st page and 6/10 are ranked in the top 3 positions. If there’s something that has changed over time, it’s that those rankings have actually increased. You see, you don’t need to publish too often when you can actually go into the Google Search Console and ask Google to immediately index your web pages by hitting a single button. This all started back in 2009, but just like many events, it has developed into a big conspiracy over time. If you were in business back in 2009, you’d remember about the Google Caffeine update and how much of a big deal it was. The update is often referred to today as the Freshness Update, because Google used the phrase “fresher results”. Although the update was announced back in 2009, it took almost a year until it finally rolled up. The thing is, unfortunately, that many people got it all wrong. The Google caffeine update has nothing to do with rankings. It’s main focus is indexing. Rankings and indexing are two very different things. Indexing is when Google takes a first look at your content and adds it to the index. That means it has the potential to be ranked. Ranking however, is a completely different story, with a much more complex algorithm behind it. This algorithm, which was updated in 2011, was actually older than you might think. Ranking “fresh content” at the top was actually happening way before that. In 2007, Amit Singhal had developed an algorithm that favored freshness for some particular subjects and queries. Note how I say “some specific queries”. Wait, let me make that bigger. Google favors fresh content only for some specific queries that deserve freshness, widely known as QDF. I know there have been some speculations that only by changing the date to an article you could make it look fresh and you could abuse the algorithm changes to make Google keep you at the top. However, they are what they are (speculations) and I promise you that for each example you give me of “fresh” content ranking at the top I can find at least 1 example of “old” content ranking at the top. In fact, I’ll give you some examples right now, from the SEO field. It’s a field that frequently changes and you always have to stay up to date in order to be relevant. You might argue that “fresher” results rank better than those. Well, you’re right but that doesn’t prove anything, because one can say “fresher results also rank below and they even come from big sites such as Hubspot”. There are factors that might influence rankings in this situation and we’ll talk about them soon, so keep reading! But thinking that you’ll rank better just by having a more recent publish date is silly. And I’ll crush it even more soon. Both Caffeine and the 2011 Freshness Algorithm Update affect mostly news sites. This is the broader category, in which you can include celebrities, general news, politics, technology, you name it. Notice a difference from the SEO examples I gave before? No article from 2009 or 2010 here, right? They’re all from 2019, posted hardly one month before me writing this post. The second article doesn’t even list the date, but instead the number of days it was posted ago. It can also be hours sometimes instead of days. Because in this case, a 2009 post would be horrible as a search result. People want to know the latest phones, not the outdated ones from 2009. Google knows the user’s intent so it tries to match the results to fit it. I have to say, I’m not quite pleased with the answer, because John has the habit of being very vague in his answers. I mean… I’ve just proven above that Google favors fresh content in certain cases. 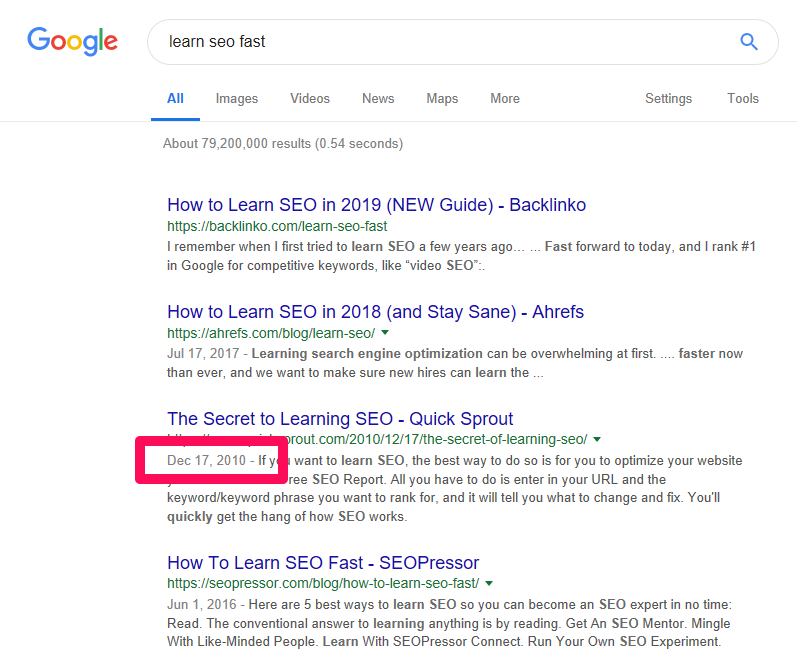 So, basically, John Mueller, Google’s representative, is trying to tell you that updating the post date every day is a bad digital marketing strategy and it won’t help you rank better. I have to admit, I miss those days when Google used to be a lot more detailed and explicit in its answers. Why? Because, as discussed, before, Google does favor fresh content, but in certain areas! And John’s answer should’ve reflected this reality, which also includes QDF. Queries that Deserve Freshness is a reality! Matt Cutts talked about this before. There are certain search phrases, such as “best android phones” which I’ve shown above as an example, that deserve freshness. Users want to see the latest posts, so here, you might have the upper hand if you keep everything up to date. Does that mean that you can keep ranking at the top by constantly changing the post date? No. Does it mean that some articles will outrank other articles because of the date when they were posted? Yes. But there are a lot of factors that signal freshness. Not just the date. Is the topic growing popular on social media platforms? Are the articles getting any new backlinks? In other words, is it something that’s happening now? Are those answers contradicting one another? I don’t think so. In the end, Google’s not perfect. It’s just an algorithm. Do you think a human person could determine better what the best result for the masses would be? I highly doubt it. Will updating old blog posts help you rank better? Probably. But not just by changing the date. Google sees those changes and it accounts for “hacks” like this. In this article, Search Engine Land stated that Google told them about one of the factors that determine freshness. It’s not the date! One of the factors that determine freshness is the time when Google first crawled the page. So no, Google doesn’t care if you keep changing the date. Does that mean you shouldn’t update your articles? No! You should always keep your articles up to date. But not just with the date. Also with the content, quality and relevancy! Has something changed since you’ve first written the article? Go and update it. Make your updates visible. This will allow users to also have a historical view on the events. The age of a web page or domain isn’t the only freshness factor. Search engines can score regularly updated content for freshness differently from content that doesn’t change. In this case, the amount of change on your web page plays a role. So the page’s age (when it was first crawled) is important, not just the publish date in the article, which can be faked. If you’re going to make small, insignificant changes, there are small chances that you will see any effects on the rankings. If you feel like your post is outdated but you don’t know exactly how to improve it, use our Keyword & Content Optimization Tool. On the right side, it will give you a list of keywords that you should use in your article in order to make it more relevant. You can view them as topics you should cover when you’re writing. The ones with dots are the most important ones. If you want to know exactly what we did to gain 70% more SEO visibility, you can take a look at our content optimization results. Keep in mind that any changes to your content might also result in negative impacts. Be prepared for this in case it happens. If you have an article that’s already ranking #1, it’s probably a better idea to leave it like that! As mentioned before, new content lacks authority, distribution and links. It’s unlikely that it will outrank older content. However, publishing new content does expand the number of keywords your site is targeting and thus it results in more traffic. It’s just simple math. Will a higher post frequency increase your rankings overall? Probably not, although it can result in more backlinks which leads to higher domain performance over time. However, a higher post frequency is almost guaranteed to increase traffic. No matter what others say, if you have 1000 followers and they read you once per week, if you make them read you twice per week, you’ve increased your traffic. It’s simple math. But remember, you also need to post good content. You have to structure it well. You have to account for your audience’s needs. Not just blindly post things there. Make sure to use the Keyword Tool to maximize your chances of ranking higher on Google when you create new posts. I don’t want you to be upset with me, so I’ll tell you some things that will actually impact your rankings and they’re closely related to freshness. Click Through Rate is a ranking factor. This has been tested and proven countless times. If users click your headline more and stick with your website, it signals Google that your site is a good result. But what impacts CTR? Well, mostly it’s the position you’re ranking for, but the 3 things that affect CTR are the Title tag, the URL and the Meta Description, because they’re all shown in Google’s search results. I hope you can see where this is going. How many times have you seen the current year or “Updated 20xx” in a title? Probably often. I mean just take a look at the “best android phones” example! It’s full of it! Why? Using the current year in your title might positively affect CTR, which can result in higher rankings. Should you change your title anually to feature the current year? Probably. But make sure your article is still up to date, otherwise Google’s going to catch that and punish you for it. If the article is still up to date, you can leave it like that. If not, you should probably improve it. You can also reshare and redistribute your content as “new” on you social media platforms. This will help you gain new backlinks and traffic if the article was previously successful. If you post new content frequently, you can expand your search visibility by targeting new keywords. This is almost guaranteed to bring more traffic if you do it right. We’ve started doing this since November 2016 and the results have been promising. Have our rankings improved overall? Yes. Was it because we published more content but with the same high quality? It certainly had an effect (more backlinks, more shares, more topical authority). Closely related to quantity is the performance of your site’s domain. This is dictated by the number of unique domains that link to your website and, very important, also by their quality. If you publish more content, target and distribute it properly, then you can increase the number of backlinks to your site, which will result in a better domain performance. If you want to check your domain performance, you can use the CognitiveSEO Site Explorer. The domain performance has a positive impact on all your articles, because Google starts to trust your site as being qualitative. Just think about it. 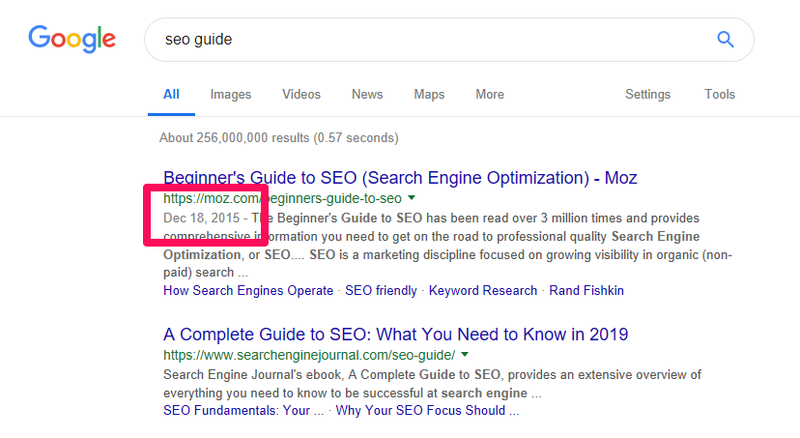 If you buy a domain today and write something about SEO (let’s say it’s the same quality), do you think you can outrank cognitiveSEO right away? It’s hardly the case. Google does favor freshers results, but only in certain cases, such as news sites. Freshness factors, like the current year in your title, can impact your CTR, which may result in higher rankings. Publishing more new content can also help you gain more links, which leads to more authority. What do you think about fresh content? Are you in a niche where fresh content is vital? How often do you publish on your site? Have you ever tried changing the date to rank higher? Has it worked? I doubt it has, but prove me wrong in the comments section. 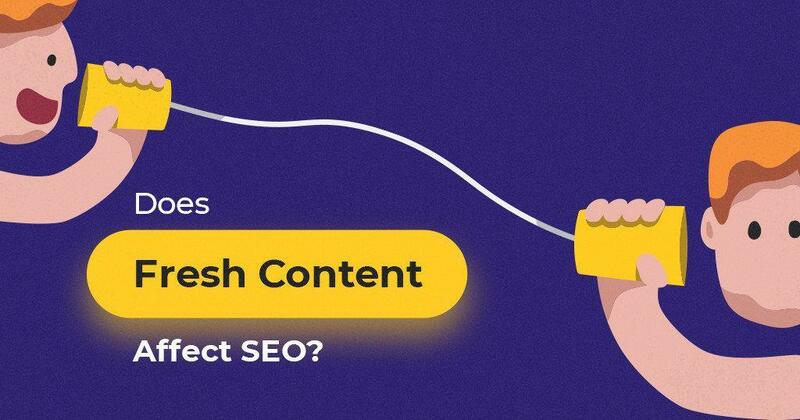 The post Content Freshness & Rankings | Does Fresh Content Impact SEO? appeared first on SEO Blog | cognitiveSEO Blog on SEO Tactics & Strategies.